Deng is in the town in search of his doctor daughter. But he still doesn’t know what has happened to her. The Beichuan Hospital where she used to work, however, collapsed, burying hundreds of doctors and patients in its rubble. “I hope there is miracle. I shuttle between the shelter and my home that now is in ruins every day. And I hope my daughter walks out of somewhere and hugs me,” Deng says. “This has become a dangerous place very fragile so fragile that even a helicopter carrying relief for the villagers could trigger a landslide,” Yang says. In Chinese, chuan literally means river and si, four. Four major rivers and high mountains have shaped the province of Sichuan. Many of the province’s 181 counties are at the foot of these picturesque mountains, with a river flowing from one end to the other. But Beichuan, which had 30,000 residents in the town seat alone, does not have any river cutting across from one end to the other. It has only one narrow opening in the west because of which it has been under the threat of floods and mudslides. So when the May 12 quake struck it brought down tons of rocks and a massive flow of mud from the mountains, intensifying the extent of the damage. Li Shizhen, a retired worker in the county’s agricultural bureau, agrees. Searching for items in the rubble that can still be used, the 76-year-old says the survivors have to be relocated now, or they will move to other cities or towns on their own. “Let every resident shift out of the town . If the name of the town disappears from the map, it could bring some solace to the people,” Li says, trying to hide his emotions. Zhou Chaoping, 38, who lives near the entrance to the town, 3 km away from the town seat, doesn’t share Li’s views, though. “Most of the villagers made their living selling fruits and vegetables to the town residents . But the town has disappeared now, and we don’t know how to earn money to feed our families.” But that does not mean the town should be wiped out from the map. 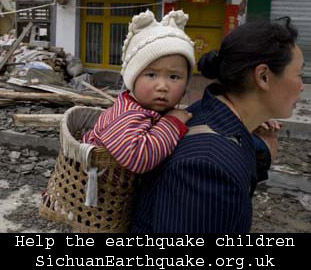 All the 280 residents in Zhou’s hamlet survived the quake, and only 30 of them suffered injuries. Beichuan is facing other threats, however. Eight days after the quake, the air is filled with the stench of rotting flesh. High temperatures and showers have accelerated the decomposing of bodies and carcasses over the days. The once green fields of the town are covered with dust, sand and rocks, big and small, which came rolling down the mountains. Some of the boulders are hanging so precariously that passersby are even afraid to cough for fear of triggering a landslide. Mosquitoes and flies threaten to spread disease. Even rescue teams, journalists and survivors crossing the town are exposed to health risks. 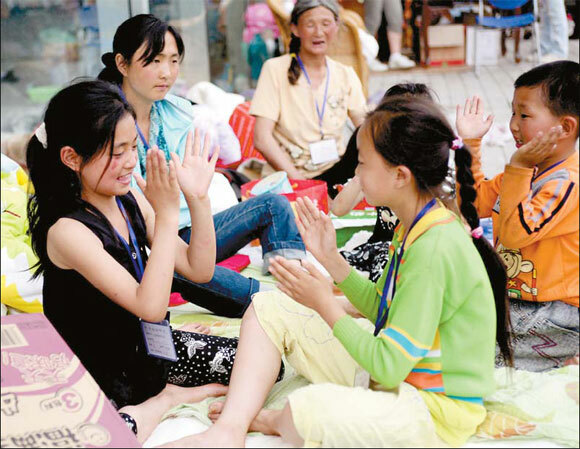 Though almost all the residents who had survived the quake have been shifted from the town, the fear of an epidemic outbreak still looms. This entry was posted on Thursday, May 22nd, 2008 at 10:42 am	and is filed under News, Stories. You can follow any responses to this entry through the RSS 2.0 feed. You can leave a response, or trackback from your own site. *Why the relatively new school buildings collapsed worse than the much older structures? *Any kickbacks [common practice in China] involved when built? *Can PRC be a superpower if the common practice of kickbacks & bribery continue as usual? Please, Naked Listener, write a Guest Post on Tom’s Blog. My friend Ying came to UK from HK 30 years ago for an arrgnaed marriage. Despite frequent visits home to visit family, she is so so much of a foreigner in HK these days. HK is changing so much and even a brief article from you would be much appreciated.